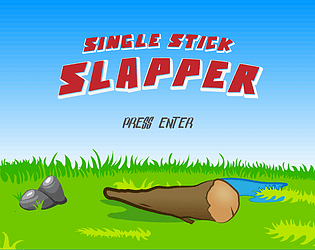 Single Stick Slapping was the theme! And copying Crashlands wholesale. Fun movement with a good soundtrack made for an enjoyable experience. Most runs I couldn't find the club unfortunately, so perhaps spawn that within a close range to the player? Also where the maps randomly generated? If so then awesome! If you couldn't stop moving, I think this would actually be really solid. Couldn't found out how to wack but man its fun to out run those bad guys. Liked the black eye on damage. It's a complete game with nice aesthetics and everything works fine, really balanced.